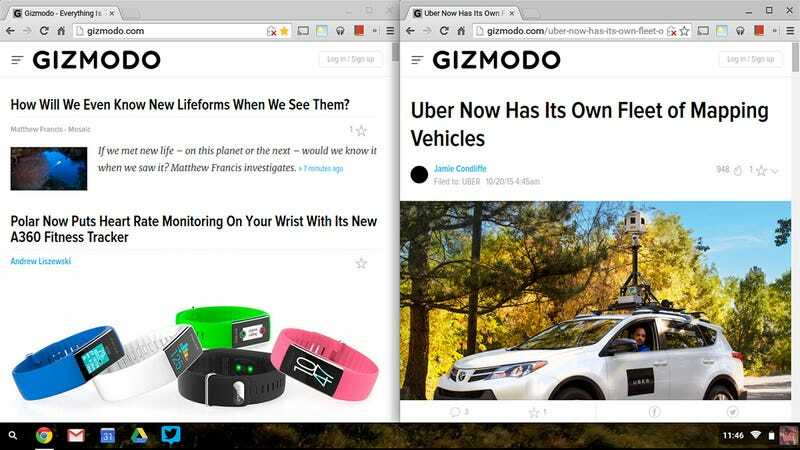 Windows 10 can do it, OS X El Capitan can do it—and Chrome OS can do it, too. I’m talking about snapping windows to the sides of the screen to make it easier to compare apps and webpages. But if you’re not familiar with the process on your Chromebook or Chromebox, then here’s what you need to do. If you’re using a trackpad or a mouse, then the process is similar to the one for operating systems made by Microsoft or Apple. You drag the title bar over to the left or right edge and then release. If you keep pushing in the same direction, the window goes to a quarter of the screen size rather than a half. You can also click and hold on the maximize button, then drag left or right when the arrows appear. For those of you who are more comfortable with keyboard shortcuts, Alt+[ or Alt+] are the combinations you need to know (a subsequent second press on the square bracket in question shrinks the window down to a quarter-size). But wait, there’s more! To resize a window, move the mouse to the left or right-hand edge, then click and drag. You’ll also see a translucent button appear underneath. Click and drag on these arrows instead, and both the left and the right windows resize at the same time.